IHOP's National Pancake Day 2016: Eat All You Can Pancakes! March 8 is National Pancake Day so from 7am to 10pm today, all IHOP branches will be serving unlimited Buttermilk Pancakes for only PhP250! And not only will you make your tummy happy, every 200 pesos of the 250 pesos will be donated to Kythe Foundation, which provides children with cancer and chronic illnesses the chance to learn, play, and grow while in treatment, even if they’re in the hospital. 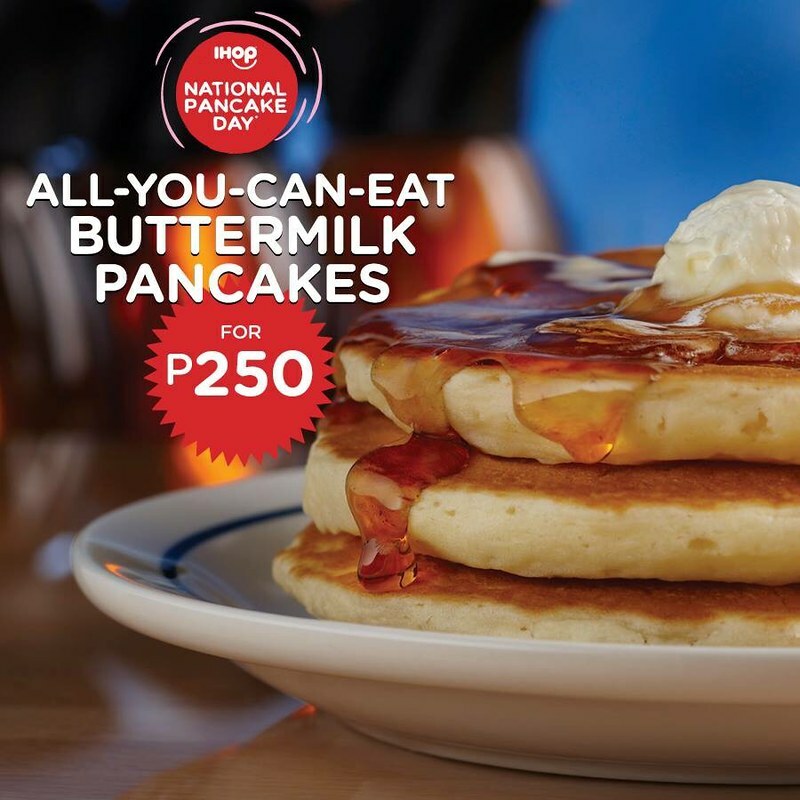 National Pancake Day began in the United States in 1995 and in the past decade has raised $20 million dollars for children’s health charities in the local communities Last year, for the first time ever, IHOP Philippines joined the celebration, raising P400,000 money for Kythe Foundation. For more information on IHOP and the National Pancake Day, follow their Facebook page via IHOP Philippines and Instagram and Twitter accounts through @ihop_ph. IHOP is located at Bonifacio Global City, UP Town Center, Araneta Center, SM Mall of Asia, Filinvest City in Alabang, and Century City Mall in Kalayaan Avenue, Makati. S&R's Summer Deals This March. Farmacy Ice Cream and Soda Fountain. Ebeneezer's Manila Now Open in BGC. Krispy Kreme's 2016 Easter Doughnuts. Save Money While Shopping Using Shopback! Ichiba: Japanese Market in Resorts World Manila. Sisterfields in Summit Ridge Tagaytay. The Gourmand Market 2016 in BGC.